There has been a lot of digging going on since my last post. 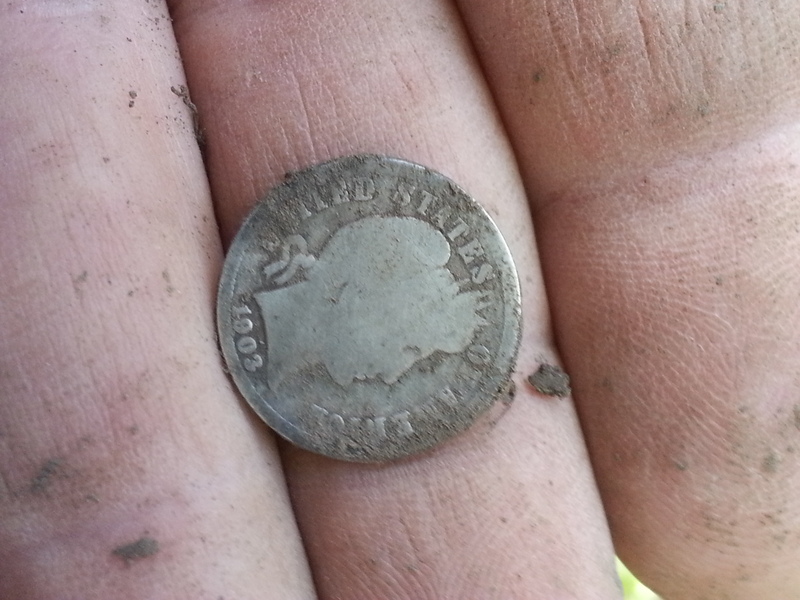 So I will hit the highlights… I metal detected (md) a 1950’s era house and found 3 silver Rosevelts. 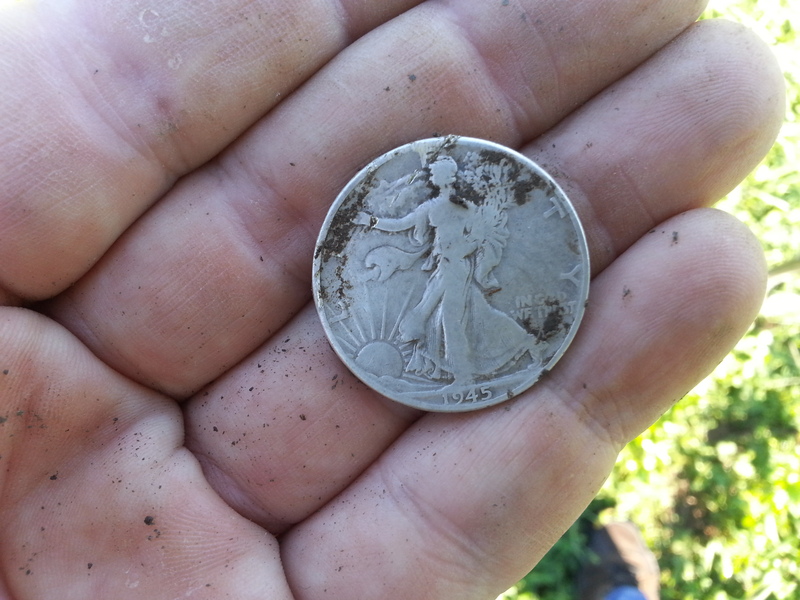 It’s good to find silver, but silver Rosevelts are not as exciting as Mercury dimes. At least for me, I think its because the Rosevelt design is still around today though now clad. I had hopes of finding silver quarters in those era of houses, but apparently not. I started md a local hundred year old park thats near me and had pretty good luck. The park has been pounded for years by other diggers, but they didn’t get it all. I hit a spot where a jumpy signals, 04-39, 10-40, 12-44, 11-41, 12-46 etc. What ever it was it was deep in the 7-9″ range. So I start by digging a deep plug, my pin pointer was quiet. So I dig more, my pin pointer chatters a little. Finally, a wheat comes out, another and another. In one hole I pulled 8 wheats and a merc! I couldn’t believe it, but I’ll take it. I ended up with 9 wheats and two merc’s. I went back there this evening and pulled a wheat and 3 merc’s in a one foot area. I’ll take it! Everything I’ve hit old there is between 7-9″. You have to go slow and double sweep your coil as you go along to give your detector a chance to ID the deeper targets. My brother has found some awesome finds where I found the seated quarter. He found a 1898 O Barber quarter, 1888 Indian head penny and 1884 “V” nickel! My friend Galen has been hitting Merc’s left and right, in fact he found 3 in one hole! So we are finally starting to hit the silver we know is out there. Not too bad for Missouri. 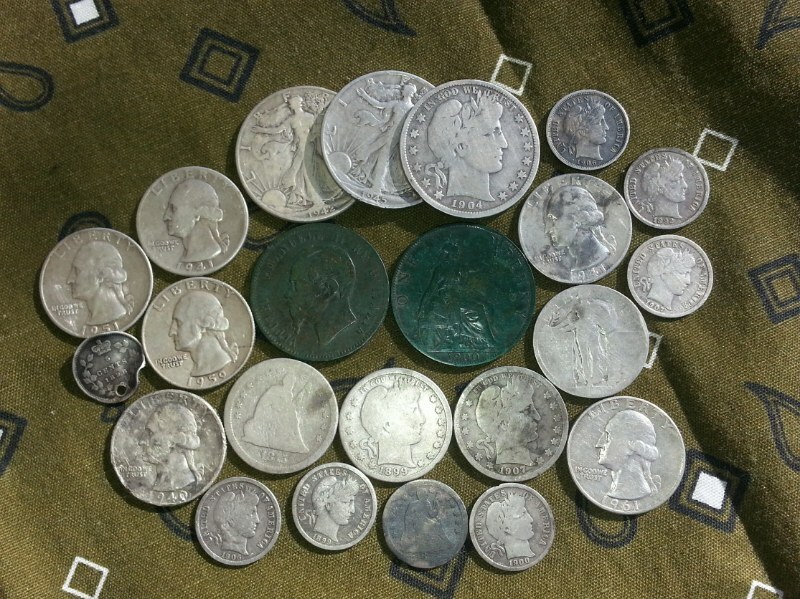 I set a goal of finding 30 silver coins this year, it looks like I’m going to have a good shot at it. First Buffalo’s of the year…..
Last year I found two Buffalo nickels, one with what I think is a 1916 date and the other was a no date. Last weekend I found two more, a 1936 S and a 1936 with full clear dates. I’m pretty happy with my self. I have a new feather in my cap and I put it there. I live in a city that is very old dating back into the middle 1800’s. If you can find a foot of ground that is in the same state it was a hundred years ago, heck 50 years ago then you found something. There are several very old parks here in town, everyone of them has been bulldozed, cut and filled, buried under new dirt and paved etc. So I’ve been studying the parks and managed to find a couple spots where its been barely touched or missed progress all together. The first park I found several modern coins, but then I found a 1943S War nickel. Sweet! I like those, silver! A 1952 wheat and that was it for now. At the really old park, I played a hunch and confirmed it through research and found two Buffalo nickels. The area is relatively small compared to the original park, that being said, myself and a friend pulled 2 Buffalo’s, a Merc and 4 wheats from this little area. Most, if not all the dates were from the 1930’s. So there is still stuff out there, you just have to find it.